Here I go again with another round of traveling, and another set of travel notes. This time promises to be much simpler and easier, though – at least in some respects. 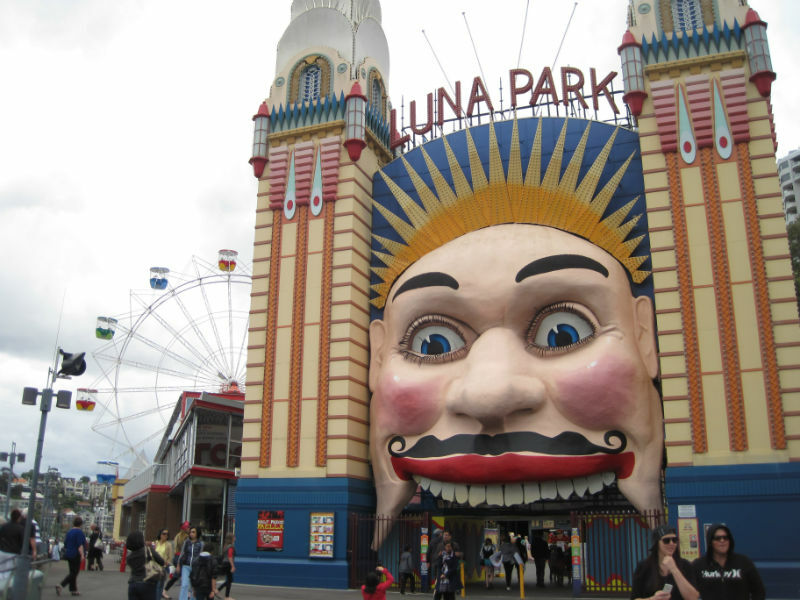 For now, and throughout my time back here in Sydney, everything is about as padded and familiar as can be. That level of comfort started right away with the flight here. I’ve come here for work – I’m attending a conference hosted by the Maps API, my old internship team – and I took full advantage of the company airfare cap. 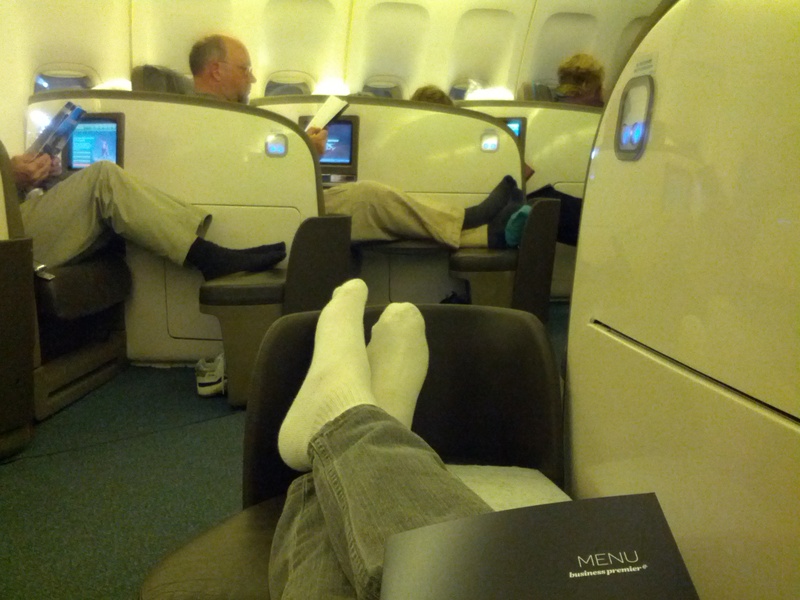 I bought a business class ticket with Air New Zealand, and got the business class treatment on my 13 hour flight from SF to Auckland. This was my first time flying anything other than economy, and you can be sure, I don’t look anything like your average business class passenger. This became obvious as soon as I stepped into the airline lounge at SFO. On average, I’d say I’m a bit less than half the age of the other passengers. White people in their 50s or 60s who dress like the generation before them. In the lounge, they’re spread around on big padded chairs reading newspapers, or else talking shop on the phone (the one conversation I overheard involved moving $1000 into the so-and-so account). I wasn’t the only person under 40, though. A portion of some Canadian volleyball (or was it water polo?) team was gathered in one area, and I spotted one young attractive guy who looked in his late-20s. The lounge itself was actually a let-down; not sure what exactly I was expecting, though. It’s basically a big quiet space (minus the occasional talker) with seating and some free gluten-y snacks that I couldn’t eat; the most exciting were individual-cookie packets of Milanos. I had some juice. There was also a bar at one end, with TVs playing the last game of the world series (yay Giants! 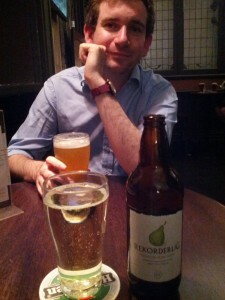 ), but the booze wasn’t free so I didn’t bother. I knew I’d get plenty more soon. When I booked the ticket, I did some research into the different sections of business class seats. On this plane, a 747, there were three: to the right as you enter the plane, just before economy; upstairs; or to the left, with seats leading up to the nose of the plane (the cockpit is upstairs). I chose the left, far-front area – as I’d read, it is the quietest and coziest section: no through-traffic, and just one seat on either side of the plane. Maybe unsurprisingly, it was even more skewed toward the elderly. I could tell the flight attendant was a little surprised when the 24 year old in a hooded jacket had a ticket for row 5. That same flight attendant reminded me of Carson, from Downton Abbey (for those of you who watch the show, imagine a little Carson grumble/harrumph). Very compulsively proper, and with a hint of an attitude about it. The other flight attendants were super nice though, and came around immediately with sparkling wine. Let the drinking begin! In total I had three large glasses of wine, along with a second full dinner (I’d already eaten before), before it was time to sleep. The food itself was nothing to speak of, at least for me; I could see the other passengers had something a bit fancier, but my gluten-free meal was exactly the same as the one I’d had in economy on this flight, 1.5 years ago. I’d really hoped I would sleep – and what with the lie-flat seat and the wine, I really should have – but I was too excited, and laid there sleeplessly for 6 hours. When I finally got to Auckland, I was so exhausted that I actually bought some sleeping pills (albeit some super-groovy “sleep aid” alternative) so I could sleep on the 3.5 hour flight on to Sydney. I took one, but even then just sat there bleary-eyed and couldn’t nod off. By the time I got to Sydney, I’d been awake for 30 hours, and it was now 10am. But you know what? It didn’t matter. 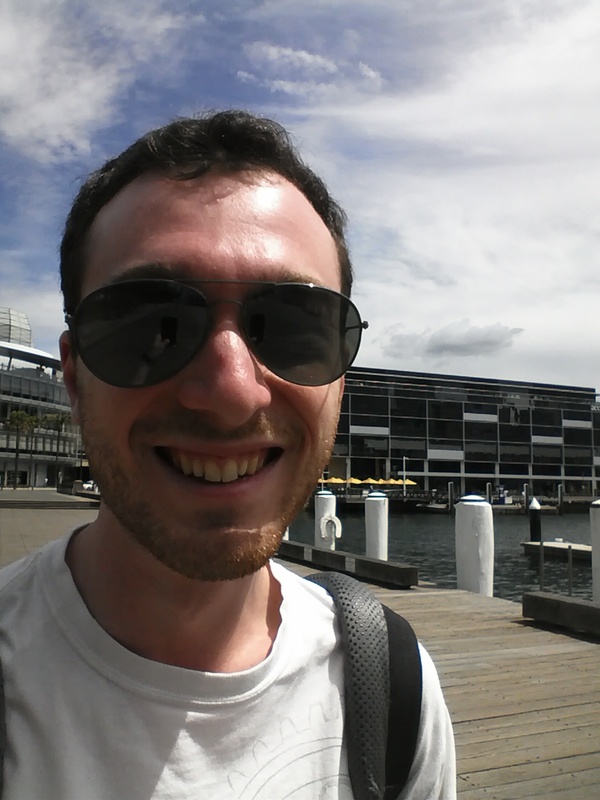 Those of you who know me will understand the kind of outrageous shock high I had from actually being back in Sydney. After a quick trip through customs and a taxi to the hotel, I was back in my old habitat, walking across the Pyrmont bridge to the Google office, absolutely slack-jawed. It really is so strange, and so amazing, to travel this incredible distance and suddenly be back in an old, super-familiar universe. That first day (Tuesday) in the office was a bit of a blur. I was too tired to really be any kind of functional, but still managed to get a few things done. I stuck with it til 5:30, at which point I had to leave to go run various errands. I did the two important things I needed to make me feel like a local again: I got cash at an ATM, and bought a SIM card. Real money, real phone. I still had to get dinner before passing out, and I have to say, that dinner was one of the best I’ve had. I went to Home Thai, which didn’t exist the last time I was here, and has great reviews. It totally lived up to expectations. Hands down, this was the best Thai food I’d eaten since being in Thailand 1.5 years ago. Green curry, with the right, authentic spices, peppers, and vegetables (read: thai baby eggplant, amazing). I also had a great view from my little seat on the stairway landing, which overlooked the kitchen and the lower floor teeming with people, food, and busy kitchen assistants. I needed to keep myself awake a bit longer, so I could fall asleep/wake up at a reasonable hour, so I took a walk through Hyde Park. Absolutely beautiful, and – as I’d forgotten – filled with bats swooping around, which was strange and wonderful. Then, finally, I slept (finally). The next day was Halloween, but per the suggestion of James McGill (my internship host), I hadn’t bothered bringing a costume – Halloween isn’t really a thing here, he said. Sydney, and the Google Sydney office in particular, was in full Halloween spirit. At 4:30pm, everyone gathered in the cafeteria for a costume contest, a trivia/challenge tournament, and lots of alcohol. I borrowed a coworker’s (Alex’s) Aussie bush hat, and was an Australian for Halloween. Afterward, a bunch of us (including the aforementioned Alex, and Abdulla) went out for Japanese food. Thursday was relatively uneventful. I met up with (ex-boyfriend) Dave for dinner and a drink; we ended up eating at an oddly tacky Chinese restaurant that specializes in Peking Duck. Of course, Dave ordered for both of us in fluent Mandarin. When he was done, the waitress turned to look at me and I just said “thanks”. She laughed and walked away. Fridays at Google Sydney typically end with an alcohol-heavy TGIF, followed by various groups of people heading out for dinner. But since TGIF was cancelled (the Halloween event had counted as our weekly TGIF-equivalent), a large portion of the office descended on Gallon, a wine bar about 5 minutes away. A number of the office execs had opened up a tab, and the food and drink orders were free-flowing. Four hours, three (?) drinks, and a dinner later, I was ready to go home, but there were plenty of people who stayed on. Thanks Mr. G! Although Thursday and Friday had been wonderfully hot (high 80s and breezy), Saturday was cool, dark, and a bit rainy. I figured I’d do some errands: I bought myself a 240-volt trimmer (my supposed voltage converter is a POS), grabbed a burger at one of my old favorite places, Grill’d (gluten-free buns! ), and then got a few gifts down at the market in The Rocks. 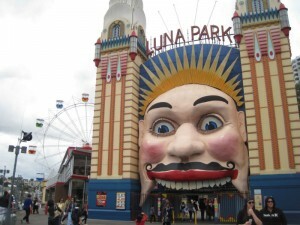 At that point I started wandering; I ended up walking across the harbour bridge to Milson’s Point, and then went to Luna Park, Sydney’s Coney Island-esque amusement park. I felt a little out of place, given that most of the people there were 7-year-old with their parents, but how could I leave without going on one ride? I ended up on the ferris wheel (which, by the way, shows up in the first 20 seconds of my favorite marriage equality ad ever), and then walked home, stopping for a cider at The Australian Hotel along the way. Dave had texted me earlier that day, inviting me to a going-away dinner/drinks for a friend of his that’s moving to Switzerland. 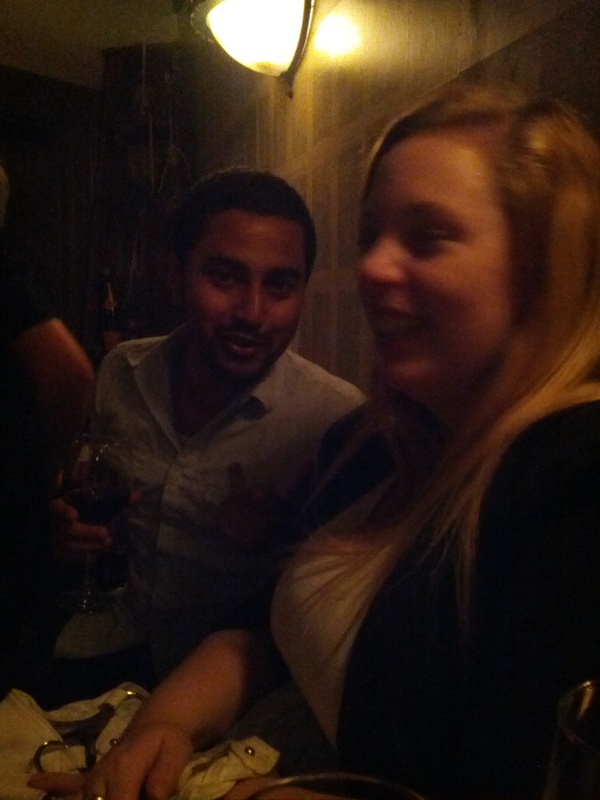 I met up with the bunch of them at 8pm for a very Aussie evening – and by that, I mean drunk. The restaurant wasn’t quite ready for us, so we went to a bar down the street and each downed a drink in our 10 spare minutes. Once seated at the restaurant, three of the four other people at the table pulled out bottles of wine; the five of us finished them all over some really good Vietnamese food. Now four glasses of wine in, we then went to another bar (because we weren’t drunk enough yet), where I had two pints of cider. The other guys kept going beyond that, but I was past my limit and stopped. Thoroughly pissed, as they say here, we continued on to two gay bars: first the Stonewall, then Arq. Let’s just say I may have let loose a bit too much…. it was an exceptionally crazy evening. Home by 4am. Sunday was a much nicer day, so I took the bus out to Bondi Beach for my usual coastal walk from Bondi to Bronte to Coogee (I’ve now done this three years in a row). 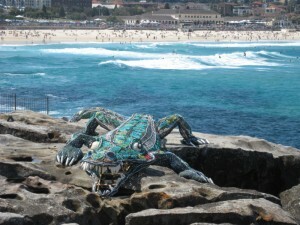 Bondi was spectacular, I laid out and sunbathed with a book – bliss. I eventually got myself up and started the walk, which turned out to be insanely packed with people. 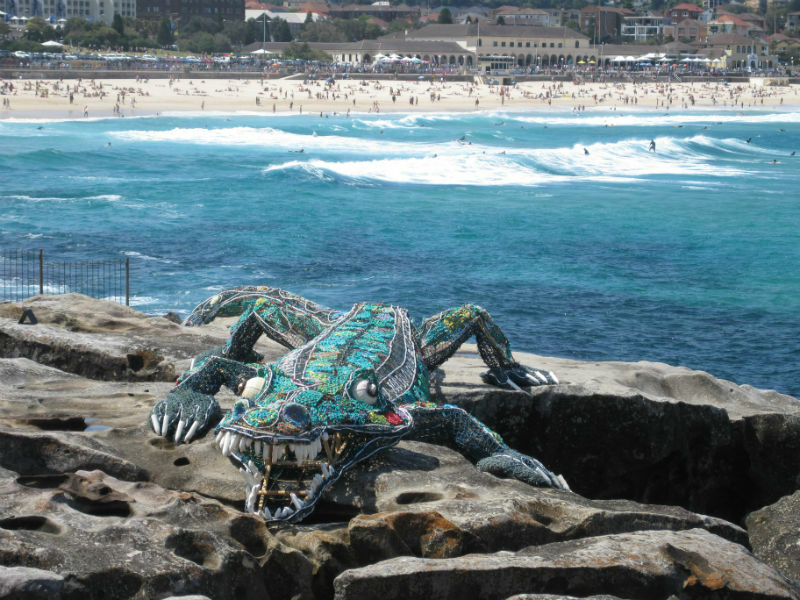 It was the last day of Sculpture By The Sea, a three-week period where sculptures are set up along the ocean-side path. Really cool, but really popular – it took me almost 1.5 hours to get to Bronte, which might have otherwise taken 30 minutes. At that point I stopped for a swim, rested, made a little sand step pyramid, and had a bowl of sweet potato and carrot soup (came with gluten-free toast!). Bronte is always one of my favorites – there’s something very cozy about the enclave, the beach, and it’s little strip of cafes. By about 6pm I’d finished the walk down to Coogee, and caught a bus back into town. That night I got dinner at Spice I Am, an old favorite Thai place, and ended up awkwardly having to share a table with another solo eater. He was a German businessman, working for Nestle, and I could barely understand him – in addition to the thick accent and so-so English, he had some kind of hearing aid. We didn’t talk too much. Today was a pretty average day – the last semi-normal one before the conference and related events and talks, which start tomorrow. I’m predicting a lot of talking, a lot of coding, and a lot more food on the company’s tab. As has become my custom, I’ll end with a local tidbit. I’ve only got one this time – I already know too much Aussie slang! When Dave and I got a drink after dinner on Thursday, I picked up the tab. As I handed him cash, the bartender said “it’s your [shau], ay?” (with [shau] pronounced as in [shower]). “Huh?” “It’s your shau.” “I don’t get it.” Apparently the word was “shout”, and “it’s your shout” is the equivalent of “it’s your round”, at a bar. Now you know. PS: I’ve been very anxiously watching the election polls, fingers crossed for Obama! Go and vote if you haven’t yet! I’m glad you’re doing well!! And yay Obama!!!! I’m glad you’re doing well. And yay Obama! !